If you have an iOS device and see the following screen, please disregard this article. Open a browser on your computer. In the URL bar, type: http://192.168.1.254. From there, select WiFi or Wireless. You will be asked for an access code. The access code can be located on the side of your router. Scroll down towards the bottom of the page. You will see an option for the guest network settings. Enable the guest network and enter a password. The password must be at least 8 characters. This password will only be used to connect to the guest network. Save your new settings. The "Save" button is a little tricky to find-- you may need to scroll to the bottom of the page to find it. Once your router reboots, you should be able to see this new Guest Network under WiFi settings on your phone. 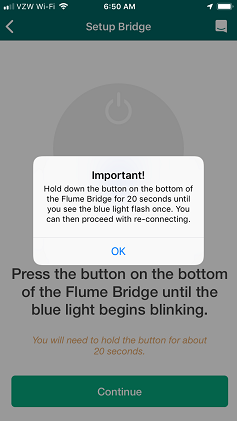 After you have successfully turned on your new Guest Network, just make sure that your phone is connected to this network during your Flume installation. Once you complete your installation, you can switch your phone back to your original network.